'S-HERTOGENBOSCH, NETHERLANDS, April 11, 2019 /EINPresswire.com/ -- Today, bioinformatics software engineering company ENPICOM announced the official release of its ImmunoGenomiX (IGX) platform: a unique platform to manage, store, analyze, visualize and interpret immune repertoire sequencing data from T and B cell receptors. When studying immune system related diseases or developing drugs influencing this system, it is extremely important to be able to directly measure and closely monitor its status. Repertoire sequencing is a powerful way to analyze hundreds of thousands to millions of T or B cell receptors swiftly and in a cost-effective way. ENPICOM’s first product on the market is a world-class repertoire sequencing data analysis solution, the ImmunoGenomiX (IGX) platform. IGX is an innovative platform to manage, store, analyze, visualize and interpret immune repertoire sequencing data from T and B cell receptors. 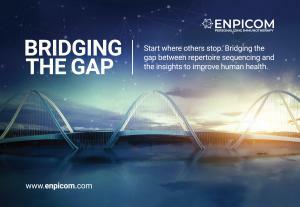 For more information, visit www.enpicom.com.